excursions around the Epte River. This work was painted in "The Clos Martin", a meadow west of Monet's House. A farmer named Quérel stored his grain stacks in this field. Here, Blanche Hoschedé-Monet captures the sunset effect in a view to the southwest toward the hills of Giverny which extend along the left bank. The light floods the scene and emanates from the painting. The interaction of light and color in the sky and the grain stack are creating a painting where the grain stack, the sky and the soil are producing Monet's Love Affair with Japanese Art a festival of orange, yellow, brown and of gold colors. Blanche is showing the golden light of late afternoon. The blue colors of the hills are creating a theatrical vision of a summer evening in Giverny. Giverny’s farms are appearing like in a stage for theater. The hills This Grain stack is also a symbol of rural traditions. The grain stack is formed when the grain had ripened and turned to gold. During that time Blanche Hoschedé is completely under the influence of Claude Monet. She is not only using the same palette, the same colors, but she herself painted next to him. We are tempted to say that the student has reached the level of the master. 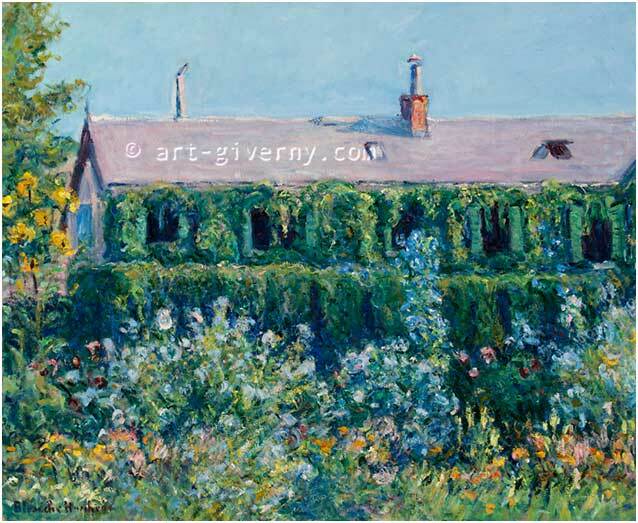 Claude Monet’s art dealer Durand-Ruel purchased a Haystack by Blanche Hoschedé Monet which is presently hanging in Claude Monet’s house in Giverny. Private collection France for the past 40 years. 1994-Exposé à l' Hotel du Département, Evreux », Mai 19_ Juilley 17 1994.